An open letter from Victor Mambor, Head of the Jayapura Branch of the Alliance for Independent Journalists, has been circulated around Papua, highlighting the pervasive involvement of Indonesian intelligence personnel and military agendas in the Papuan press. This letter (see below) comes at a time when the Indonesian-run colonial press in West Papua is coming under repeated attack from both Papuan and Indonesian religious and civil society figures, independent media and human rights organisations, for its unethical and blatantly false reportage of the recent upsurge in “unknown killings” in Papua, referred to as OTK (orang tidak ketahui or unknown persons, now wryly referred to across Papua as Orang Terlatih Khusus or Specially Trained People). Indonesian owned media outlets in Papua have long been identified with Indonesian intelligence and propaganda activities, with many outlets being directly owned by military officers for profit, and almost all media outlets coming under the control (either willing or not) of Indonesian intelligence personnel. 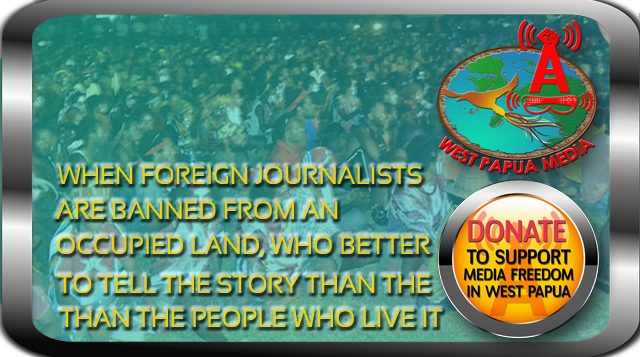 West Papua Media wrote a detailed section in the 2011 Pacific Media Freedom report and highlighted the issues faced with press freedom in West Papua, which detail the tactics Indonesian occupation forces use to limit factual reportage in Papua, and to dissuade journalists from doing their job. However, as time wears on, the Indonesian colonial press is becoming even more blatant in pushing an agenda in step with the Indonesian military agenda. This agenda is being keenly felt by members of the nonviolent civil resistance movement and Papuan civil society, particularly members of the West Papua National Committee (KNPB), who are being blamed for the OTK campaign despite no evidence being presented to prove the military assertions, with what little evidence present having been entirely fabricated by a Police to terrified to point the finger at the real perpetrators of violence in Papua – their big brothers in the military. This spreading of falsehood has reached a crescendo around the assassination of KNPB leader Mako Tabuni, who was gunned down in an execution on June 14 by Australian trained Detachment 88 officers in Jayapura. Justifying their criminal act, Indonesian police have variously claimed that they shot Mako in self defence, despite many witness claims that he was shot in the back while on the ground. Indonesian police then fabricated evidence including placing a handgun on his body in the hospital, and loudly announcing that Mako was responsible with other KNPB members for the series of OTK shootings, including the shooting of a German tourist. This is despite the unchallenged fact that all shooting were carried out with men in broad daylight who made no attempt to hide and nonchalantly drove away in the DS (Police) plated Avanzas. This was reported uncritically by many in the colonial Indonesian press in Papua, with ironically perhaps, the truth telling in Indonesian metropolitan media coming from independent human rights journalists who went out a their limbs by telling the story of the peaceful activist and freedom fighter whom they had all met and spent time with in his attempts to non-violently raise the issue of his peoples suffering under colonial genocidal policies. Yet the shootings continue, even with the official suspect dead, with nary a comment coming from the colonial press, a situation that is a direct repetition of the assassination of Kelly Kwalik on December 16, 2010. Kwalik was also blamed for the OTK shootings that have plagued the giant Freeport Grasberg Gold and copper mine for many years, shootings widely blamed on a spat between Brimob police and the TNI for control of mine protection and illegal gold mining businesses. Again, despite the assassination of Kwalik (again by Detachment 88 officers), the shootings continue, and will continue as long as the Indonesian security forces use conflict as a way of guaranteeing their presence. A presence that’s only purpose is to exploit natural resources and make the General’s money – at the heart of why Papuan people resist the colonisation of their Land. As Mambor has outlined in his letter, Giay made a series of formal complaints to the Indonesian Press Council and journalists’ associations about the lack of integrity of Indonesian so-called journalists in Papua and of their non-factual scapegoating of ordinary Papuans for separatist and violent actions. This seems to have already threatened powerful people, as a source close to Giay had told West Papua Media that he was physically threatened by a member of the security forces during his advocacy work in Jakarta. But this behaviour by intelligence services and their not-very-opaque “journalists” is causing many independent media to look at other tactics to regain their Papuan voices. Just as Victor Mambor has done with his heartfelt letter, the independent Papuan citizen media outlet UMAGI News has taken a bold step in publicly naming a group of Indonesian reporters that it believes are paid intelligence officers under the command of the Cenderwasih military command. In an editorial, UmagiNews have argued that most Indonesians who serve in professional Media in Papua do not carry out the tasks and functions of a journalist. “Whether in Print, electronic or online media, (journalists should) convey information what has happened, seen, heard, felt. To be independent means to report the events and facts in accordance with the voice of conscience without interference, coercion, and the intervention of other parties including the owners of the press,” said the Umagi editorial. Umagi News published the names of the following reporters whom it says it has gathered evidence that shows their active collaboration as informers and/or trained agents with civilian or military intelligence services. Umagi claims its information has come from sources within both the security forces, and from a TNI document from the command of the XVII/Cenderawasih Military Region Taskforce 6 “datasheet of informants/agents”, signed by one Ahmad Fikri Musmar (NRP inf Captain 11,970,044,410,576). All suspects are ethnic Indonesians and non-Papuan. 1). M. Imran (Contributor TV One) . 2). Robert Vanwi (Suara Pembaruan). 3). Safe Hasibuan (Bisnis Papua and Radio Elshinta). 6). Rio (Radio Enarotali RPD). 7). Agus Suroto (Metro TV). 8). Evarianus M Supar (2000-2002: Journalist at Radar Kupang Timor, 2003-2006: Journalist / Editor Timika Pos Daily, 2007 – Now: Journalist and Antara’s Timika agent). 9). Anis (SCTV Contributor, Mimika) Note: The concerned had fled from Timika since the shooting of Kelly Kwalik. 10). Odyi (RRI Sorong, Chairman PWI Sorong). 11).Jeffry (Radar and Dita Sorong Sorong). 12). Angelbertha Sinaga (Pasifik Post). West Papua Media has sought clarification from independent journalists and human rights sources in West Papua about the veracity of these names, and our sources have concurred with the accuracy of the names given in the Umagi report, though West Papua Media has not yet been able to see the document first hand. (UPDATE: WPM has possession of the original Kodim document and has verified all names contained, independently). However this is not a new claim. For example, On May 16, The TNI held a major meeting with Indonesian press representatives in Sorong, and encouraged soldiers and journalists to work together to ensure “balanced coverage of the affairs of the function and duties of the TNI… so that it can be beneficial for society.” The commander of the TNI in Sorong, Colonel Inf Wiharsa Eka, even exhorted all present to monitor events together, as “it runs the full atmosphere of intimate friendship, and even a means to know each other. The journalists should exchange phone numbers, either with me or Danyon commander (Commander Batalyon),” said the Colonel. With friends like these soldiers, how could an honest journalist possibly have any fears of reporting events factually in Papua? Papuan people reclaiming their own media space is an inevitable next step in the struggle for self-determination. The building a free and robust credible independent media is the basis for any democratic society – and indeed this is the core mission of West Papua Media. But Indonesia’s deliberate manipulation of the truth and its corruption of the principles of journalism in West Papua, together with the ongoing and constant threats to brave professional and citizen journalists in Papua for telling the truth, are giving those committed to genuine journalism more impetus every day to give voice to the voiceless, and to help the voiceless roar in Papua. (dedicated to the brave storytellers of freedom risking their lives everyday in Papua to bring light to a darkened place). 1. AJI is a professional organisation of independent character and so places a high value on the media’s independence. 2. Journalists and their reporting are fully the responsibility of the editorial team at the journalist’s place of work, or where the news they produce is published. 3. AJI does not assume a capacity to take action against journalists or media who are considered to have taken action such as listed above. It can only take action if a member is considered to have violated the journalist’s code of ethics and that of AJI as a professional organisation. 4. I also truly understand how many colleagues and friends feel about reporting that tends to push indigenous Papuan people into a corner, and so seems to endorse the view that indigenous Papuans are separatists and the perpetrators of recent acts of violence. For this reason I very much support the actions Benny Giay CS has taken in making complaints to press and journalist organisations in Jakarta about this problem. 5. There is no need to feel hesitant or reluctant about placing limits on journalists during press conferences or activities. If it is suspected that someone is not a journalist, do not hesitate to remove them or report them to the police. There is no way to justify or defend journalists like this. Many journalists even have a dual job, also acting as informants for interested parties and are involved in the marginalisation of indigenous Papuans and feeding the stigma that they are separatists. Pay close attention to media or journalists who often mention the name Dani Kogoya or the confiscation of Morning Star flags, bullets etc. (this is about journalists present at the scene of an incident, not those reporting from police press conferences), or those that have produced features for television about young people who are OPM members, or journalists who are able to obtain special reports about the OPM or unrest in the interior connected to the OPM. These are the journalists and media which you should be cautious about. These no-good journalists’ space to operate must be curtailed because aside from selling out their profession they are also destroying Papua and propagating the stigma of Papuans as separatists. Watch out for and be careful with such journalists. Because from my own observations, many of us are so keen to progress that we do not act with caution and we are not aware if our activities are being recorded to be later reported to certain parties, and will be used in constructing counter-opinions. 6. An attendance list is vital for activities or press conferences. It means that if a media outlet or journalist was not present at an event but then writes report on the activity or what was mentioned in the press conference, it can be reported as a form of deception or unethical activity for a journalist. Such journalistic practices cannot be justified, but find fertile ground amongst journalists in Papua. This is another problem to Overcome – Free West Papuan People and the World will always look to Honest People for their News .Identifying and naming the Agents of evil is important . Yes it is. Show us the evidence that contradicts anything this article and we will gladly assess it. We have not published the full Data Wartawan dan Informan list as it would endanger other people on it. But we have the source documentation and it met our editorial policies. 52 pages of Indonesian intelligence informants, and many pages of “journalists” who are paid by the security forces to write favourable material. That is not journalism – that is propaganda. Sorry, lie with dogs, and you will get up with fleas.